Conducting a “Where are they now?” investigation on your favorite childhood stars can be a real gamble. You just never know what kind of personal tragedy has befallen them in the decades since they graced our television screens. 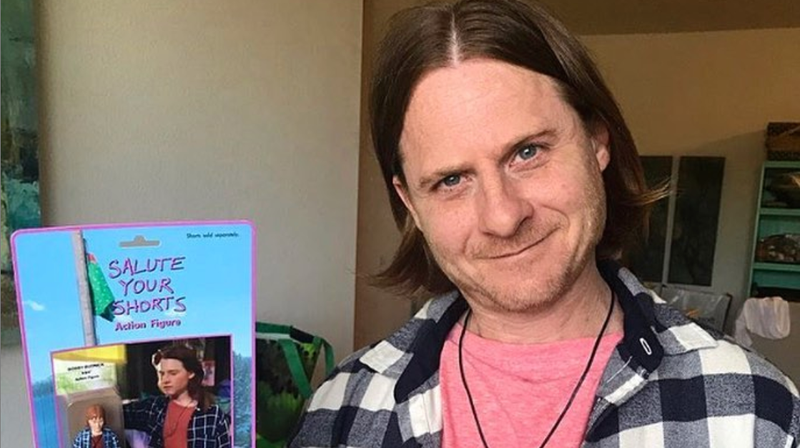 Fortunately, we can now say with some level of certainty that former Salute Your Shorts star Danny Cooksey is doing just fine, especially since getting a hold of his very own Bobby Budnick action figure. Cooksey, who credits himself on his Instagram profile as “the little white kid from Diff’rent Strokes, the guy with the sweet mullet from Terminator 2, and, yes, Budnick,” recently received this custom-made action figure from Death By Toys, a nostalgia-peddling custom toy shop run by Dan Polydoris. As one would expect, a plethora of “playing with my tiny Budnick” jokes ensued. Polydoris admits to preferring toys from 1980s properties—such as his Evil Dead “Horny Twigs” set and his Beverly Hills Cop banana—but couldn’t refuse when someone asked him to commission a Salute Your Shorts character. “I loved this show as a kid…Anyone who didn’t like it will be getting an awful waffle,” Polydoris writes on the original post showing a better close-up of the completed toy. With the success of this one-off figurine, it seems fairly obvious that Death By Toys should just go ahead and complete the whole Salute Your Shorts set, and maybe they could make more than one of each this time. We certainly wouldn’t mind getting our hands on a mint-condition Donkey Lips.